Soricomorpha is an order of placental mammals that includes the true shrews (family Soricidae); moles, shrew-moles, and desmans (family Talpidae); solenodons (family Solenodontidae), and members of the extinct family Nesophontidae. These families were originally placed in the now extinct order Insectivora. However, Soricomorpha is itself considered to be paraphyletic and often is replaced in taxonomic schemes with the order Eulipotyphla, with includes members of Soriciomorpha and the family Erinaceidae (hedgehogs and gymnures or moonrats). Members of this order (as well as the order Eulipotyphla) are small mammals with long, narrow, and pointed snouts, ranging in size from but 3 grams and 3.5 centimeters to over 60 centimeters and over 1 kilogram. Soricomorphs are found in all continents except Australia and Antarctica. Soricomorphs play key ecological roles in food chains, feeding on many invertebrates (larval insects, earthworms, snails,) and small vertebrates (fish, frogs, lizards, mammals) as well as roots and plant parts and being preyed upon by many predators (mammals, birds, snakes). The fossorial nature of moles helps in aerating soils and they consume some invertebrate pests that damage agricultural and garden crops. Mole tunnels can be a disturbance for lawns, pastures, and golf courses. Soricomorpha includes the three extant families of Soricidae, Talpidae, and Solenodontidae, and the extinct family Nesophontidae. Soricidae (true shrews) is the family of Soricomopha with the most known species, with about 300 species. Talpidae (moles, shrew-moles,and desmans) has about 42 known species, and Solenodontidae (solenodons) has two known extant species and two known extinct species. The final family Nesophontidae (West Indies shrews) placed in this order is only known in the fossil record. In previous years, the soricomorphs formed a significant group within the former order Insectivora. However, that order was shown to be polyphyletic and various new orders were split off from it, including Afrosoricida (tenrecs and golden moles), Macroscelidea (elephant shrews), and Erinaceomorpha (hedgehogs and gymnures), leaving just the four families, leaving Insectivora empty and disbanded. Subsequently, Soricomorpha itself was shown to be paraphyletic, because Soricidae shared a more recent common ancestor with Erinaceidae than with other soricomorphs (Roca et al. 2004). The combination of Soricomorpha and Erinaceidae, referred to as order Eulipotyphla, has been shown to be monophyletic (Beck et al. 2006). Soricomorpha means "shrew-form" and members of this order are small, have long, slim, and pointed rostrums, small eyes and short or absent ear pinnae. The smallest member of this order, the pygmy white-toothed shrew or Etruscan shrew (Suncus etruscus), is but 3 grams in weight and about 3.5 centimeters in body size. On the other hand, Cuban solenodons can reach 60 centimeters in size. Most shrews are no bigger than 12.7 centimeters in length, excluding the length of their tail, while moles tend to range from 6.1 to 43.2 centimeters in body length. 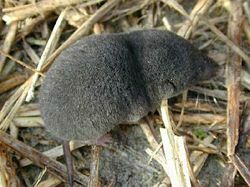 Shrews and solenodons have five-toed feet, while most moles have forelimbs modified for a fossorial life, such that they can "swim" through soil, while those moles those adapted to aquatic environments, such as desmans, have webbed feet. Moles fur is velvety and smooth (Patsy et al. 2014). Soricomorphs are found in all landmasses except those in the Australian and Antarctic regions. Desmans are found in Europe and Russia. Members of Solenodontidae and Talpidae are fossorial, with desmans being semi-aquatic, found in areas such as swamps, rivers, streams, ponds, and marshes, and even fast-moving water. Mole tunnels are normally 4 to 5 centimeters wide and some are as deep as 150 centimeters. Soricomorphs tend to be solitary and nocturnal (Patsy et al. 2014). Moles feed primarily on invertebrates such as insects, earthworms, and snails, but some aquatic species also prey upon fish and frogs. They also will eat things that fall into their tunnels and plant parts. Shrews consume insects, small vertebrates, fruit, and seeds, but also will eat lizards, frogs, small mammals, and other shrews. Solenodons each spiders, earthworms, insects, and other invertebrates found above ground, tending to root in the ground and tear through rotten logs; they also consume small amphibians and reptiles (Patsy et al. 2014). The small size of soricomorphs has resulted in their need to consume considerable amounts of food. In particular, the small size of shrews and their inability to store fat well has resulted in their need to consume large amounts of food, daily consuming 80 to 90 percent of their body weight and some much more than this, even up to four times that amount. The Eurasian pygmy shrew (Sorex minutus) must eat virtually all the time (Patsy et al. 2014). Beck, R., O. Bininda-Emonds, M. Cardillo, F.-G. Liu, and A. Purvis. 2006. A higher level MRP supertree of placental mammals. BMC Evolutionary Biology 6: 93. PMID 17101039. Patsy, V., J. Song, R. Weber, and L. Siciliano Martina. 2014. http://animaldiversity.ummz.umich.edu/accounts/Soricomorpha Soricomorpha]. Animal Diversity Web. Retrieved May 31, 2014. Roca, A. L., G. K. Bar-Gal, E. Eizirik, K. M. Helgen, R. Maria, M. S. Springer, S. J. O'Brien, and W. J. Murphy. 2004. Mesozoic origin for West Indian insectivores. Nature 429(6992): 649–651. PMID 15190349. This page was last modified on 1 June 2014, at 17:13.